"Alpha Jet" redirects here. For other uses, see Alpha Jet (disambiguation). The Dassault/Dornier Alpha Jet is a light attack jet and advanced jet trainer co-manufactured by Dassault Aviation of France and Dornier Flugzeugwerke of Germany. It was developed specifically to perform the trainer and light attack missions, as well as to perform these duties more ideally than the first generation of jet trainers that preceded it. Following a competition, a design submitted by a team comprising Breguet Aviation, Dassault Aviation, and Dornier Flugzeugwerke, initially designated as the TA501, was selected and subsequently produced as the Alpha Jet. Both the French Air Force and German Air Force procured the Alpha Jet in large numbers, the former principally as a trainer aircraft and the latter choosing to use it as a light attack platform. As a result of post-Cold War military cutbacks, Germany elected to retire its own fleet of Alpha Jets in the 1990s and has re-sold many of these aircraft to both military and civilian operators. The Alpha Jet has been adopted by a number of air forces across the world and has also seen active combat use by some of these operators. In the early 1960s, European air forces began to consider their requirements for the coming decades. One such area of consideration was the requirement for a new generation of jet-powered trainer aircraft to replace such aircraft as the US-built Lockheed T-33 Shooting Star and French-built Fouga Magister. Britain and France established a collaborative program to pursue development of what was initially intended to become a supersonic jet aircraft. This aircraft was to be produced in two distinct variants for different roles: trainer and light attack aircraft. The result of this collaboration, the SEPECAT Jaguar, proved to be an excellent aircraft, but its definition had changed in the interim, and the type emerged as a full-sized, nuclear-capable strike fighter, whose two-seat variants were used for operational conversion to the type. As such, the Jaguar was not well suited for the general training mission. This left the original requirement unfulfilled; as a result of this outcome, in 1967, France entered into a series of discussions with West Germany on the topic of a prospective collaboration effort to meet this demand. West Germany was keen to participate in such talks, having long held an interest in conducting joint training operations with France along with a desire for strengthening positive political relations between the two nations. France also valued military cooperation with West Germany, wanting to break a perceived German ideological preference for American aircraft. In 1968, a joint specification was produced out of these talks. One substantial change to the requirements was that the sought trainer was now specified to be subsonic, supersonic trainer aircraft having proven to be superfluous to practical requirements. In July 1969, a joint development and production agreement was signed between West Germany and France; under the terms of this agreement, the two nations committed to purchasing 200 aircraft, these being domestically assembled in each of their own countries. At one point, both the German government and the German Air Force had been keen to relocate pilot training activities from the United States to France as part of the project. In 1971, however, this was abandoned over fears of a hostile US reaction and West Germany's offset obligations to the United States making such a move unpalatable. While the joint Franco-German training proposal was abandoned, the German government felt obligated to proceed with the aircraft program; at the time, Germany did not require a new trainer aircraft, but it did have a need for a replacement for its fleet of Fiat G.91 attack aircraft. Accordingly, Germany proposed that the aircraft be built in two distinct versions, as an inexpensive trainer for the French requirement, and as a close air support platform for the German requirement; this position was accepted by France. An initial point of contention whether to use a French or American powerplant for the aircraft was also settled, with France agreeing to solely finance the development of the French-built Larzac engine while Germany agreed to adopt the same powerplant. A total of three groups of manufacturers produced proposals in response to the requirement; these were Dassault, Breguet and Dornier submitted the "TA501", which had been developed through a merger of the Breguet 126 and Dornier P.375 concepts, VFW-Fokker submitted their "VFT-291" aircraft, while SNIAS/MBB submitted the "E.650 Eurotrainer". Each of these proposals were to be powered by twin SNECMA Turbomeca Larzac turbofan engines. The German Air Force had insisted that the trainer have two engines after having suffered from severe aircraft attrition rates due to the high accident rate of the single-engine Lockheed F-104 Starfighter. On 23 July 1970, the Breguet-Dassault-Dornier TA501 was declared the winner of the competition. In February 1971, the project definition phase was formally completed and the integrated design team was formally set up at Saint-Cloud, Paris, France; that same month, a join Franco-German protocol was signed, launching the construction of four prototypes. In February 1972, the approval to proceed with full development was issued. In May 1972, the first project meeting was held in Bordeaux, at which the order for the four prototypes was formally placed. By November 1972, the project had passed its first mock-up review. Dassault was designated as the 'pilot' company for the project and possessed final authority on design and management decisions, this approach to project management has been claimed to have been a mostly efficient manner of running the program. Two prototypes were to be built by Dassault in France (Dassault having bought out Breguet in the meantime) and a further two were to be built by Dornier in Germany. On 26 October 1973, the first French prototype performed its first flight at Istres, Marseille; on 9 January 1974, the first German prototype conducted its maiden flight from Oberpfaffenhofen, Bavaria. The remaining two prototypes were in the air before the end of 1974. The first and second prototypes were used to explore the aircraft's flight envelope, the third prototype was fitted with the French trainer equipment fit and the fourth with the German close air support equipment. The prototypes were equipped with recording and telemetry equipment packages, allowing for instrumentation readings and other useful data to be received on the ground in real time during test flights. Manufacture of Alpha Jet sub-assemblies was divided between France (Dassault), Germany (Dornier) and Belgium (SABCA), each country performing final assembly and checkout of the type in separate facilities. Dassault hosted the largest of these three assembly lines, typically producing 13 aircraft per month to meet the needs of French and export customers, it was reportedly capable of a maximum output of 15 Alpha Jets per month; the Dornier final assembly line typically maintained a maximum rate of six aircraft per month. In contrast to the final assembly arrangements, none of the three sources duplicated the manufacture of any component: Dassault-Breguet produced the front and center fuselage, Dornier constructed the wing, tail and rear fuselage, while SABCA manufactured the nose and flaps of the aircraft. A total of 4,500 people were employed in the manufacturing of the Alpha Jet in Germany, an equal number in France also worked on the programme. Both Belgium and Egypt, who were early export customers for the Alpha Jet, domestically performed the final assembly of their French-configuration Alpha Jet E aircraft. On 17 September 1978, Dassault and the Arab Organization for Industrialization (AOI) signed a license manufacturing agreement for the Alpha Jet; Egypian assembly work was carried out in a facility in Helwan, Egypt. In July 1978, Dassault signed an agreement with American aircraft manufacture Lockheed to market the Alpha Jet in the US market, the arrangement included provisions for Lockheed to manufacture the Alpha Jet under license. It was considered as a candidate for the US Navy's VTXTS advanced trainer program (eventually won by the McDonnell Douglas T-45 Goshawk, a modified version of the Hawker Siddeley Hawk); proposed modifications included undercarriage changes for nose-tow catapults and a stronger arrestor hook, as well as various US-sourced avionics and other equipment. On 4 November 1977, the first production aircraft made its first flight. In September 1978, deliveries of production Alpha Jets formally commenced. The four prototypes remained in service as flying testbeds, being used for further development of the type such as to evaluate a composite graphite-epoxy wing and improved versions of the Larzac engine. Prototype 01 was specifically used early on to support the development of the Larzac engine. The different avionics fit makes French and German Alpha Jets relatively easy to visually distinguish the two, with French planes featuring a rounded-off nose and German ones featuring a sharp, pointed nose. In 1980, work began on an "Alternate Close Support" version of the Alpha Jet, featuring a SAGEM ULISS 81 INS, a Thomson-CSF VE-110 HUD, a TMV630 laser rangefinder in a modified nose and a TRT AHV 9 radio altimeter, with all avionics linked through a digital databus. Initial flight was on 9 April 1982. Cameroon obtained seven (some sources claim 6) and Egypt obtained 15. As with the original Egyptian order for MS1 machines, Dassault provided four such machines under the designation of MS2 and AOI of Egypt assembled the other eleven from knockdown kits. The Alpha Jet 2, originally the Alpha Jet NGEA (Nouvelle Generation Appui/Ecole or "New Generation Attack/Training") was a proposed development of the Alpha Jet. It featured the basic avionics of the MS2 plus compatibility with the advanced French Matra Magic 2 AAMs and the more powerful Larzac 04-C20 turbofans refitted to Luftwaffe Alpha Jet A aircraft. Some of the aircraft's new avionics were derived from the Dassault Mirage 2000 fighter. In 1982, it was claimed that the Alpha Jet NGEA was the "only existing aircraft in its category featuring a completely integrated digital navigation and attack system". While no new-build aircraft were produced of this variant, existing Egyptian Alpha Jets were reportedly upgraded to a similar standard. A single prototype was flown, presumably a modification of one of the original Alpha Jet prototypes. In September 1982, this aircraft made its first public appearance at the Farnborough Airshow. Another proposed variant was the Alpha Jet 3 Advanced Training System, at one point given the title of "Lancier". This proposal was intended to perform all-weather ground attack operations, as well as to perform anti-shipping and anti-helicopter missions. Featured many of the same systems as the Alpha Jet 2, it also was to be equipped with twin cockpit multifunction displays (MFDs) and potential carriage of AGAVE or Anemone radar, a forward-looking infrared (FLIR) imager, a laser targeting system and a modern countermeasures suite. A prototype was also flown, again presumably an upgrade of an original Alpha Jet prototype. In June 1985, Dornier announced that it was studying its own third generation Alpha Jet upgrade program, independent of Dassault. This proposed upgrade involved substantial avionics upgrades and man-machine interface alterations, such as the addition of multiple head-up displays (HUDs) to allow instructors to view what students are viewing, with the aim of being more suited for the sophisticated requirements of modern and impending fighter aircraft; Dornier had judged the Alpha Jet's airframe itself to have been suitable without modification for future market needs. In September 1988, Dassault revealed that it had proposed a navalised variant of the Alpha Jet as a carrier-based trainer to the French Naval Aviation as a replacement for their Fouga CM.175 Zéphyr and Dassault Étendard IV fleets. Designated Alpha Jet Maritime 3, it was promoted as having been fully navalised and fitted with the avionics intended for the Alpha Jet 3 Advanced Training System to give it compatibility with the upcoming next generation of carrier fighter aircraft. Carrier adaptions included the addition of an arrestor hook as well as a strengthened landing gear and undercarriage. The Alpha Jet is a light twin-engine aircraft equipped with an intentionally simple airframe despite the performance delivered. Both the leading edges and air intakes are fixed; while the aerodynamic shape of the aircraft, which was developed with the aid of computer aided design (CAD), conforms with the area rule. Fully powered controls are used, comprising a dual-hydraulic systems and load-factor limited dynamic feel system arrangement attached to conventional flight control surfaces. The cockpit is pressurised for greater comfort during training. The Alpha Jet is designed to accommodate ten-minute turn around times with minimal ground equipment, using features such as pressurised single-point refueling, ladder-less entering/egress of the cockpit, and a ten-hour endurance of the liquid oxygen system. The Alpha Jet was designed to perform a diverse range of roles. The principal users of the type, Germany and France, operated their Alpha Jets in different capacities, the former as a ground attack platform and the latter as a trainer aircraft. Beyond performing different roles, the Alpha Jet fleets of France and Germany noticeably differed in their specification and equipment; German aircraft were fitted with a more extensive weapon-aiming system, a different fuel system, a yaw damper, different brakes, nosewheel steering, an arrester hook, and Stencel ejector seats in place of Martin-Baker. According to aerospace publication Flight International, the majority of the specialised equipment used on the ground attack-orientated variant of the Alpha Jet was provided by German firms. In addition to the ground attack role, the Luftwaffe also employed the Alpha Jet in the electronic countermeasures (ECM) and aerial reconnaissance roles; for the latter purpose, a reconnaissance pod could be fitted upon the port hardpoint. The Alpha Jet is powered by a pair of SNECMA Turbomeca Larzac turbofan engines. It is a low bypass-ratio, twin-spool engine that uses modular construction methods. The Larzac was a new engine at the time, having only performed its first run a year prior to being selected to power the Alpha Jet. The need for greater thrust to power the aircraft than the original model of the engine could generate led to the development and adoption of the 2,970 lb Larzac 04 in February 1972; it was this version of the engine that initially powered the Alpha Jet. Germany was interested in powering the type with the General Electric J85, but France objected to the use of an American engine which would result in US export restrictions upon the overall aircraft and agreed to assume the cost of developing the French-built Larzac. During the 1980s, an upgraded model of the Larzac engine which increased the thrust by 10 per cent was developed. The avionics of the original version of the Alpha Jet were of an austere nature, partly to make it a simple and easily exportable aircraft. The basic type lacked features such as an autopilot, inertial navigation, or a radar. Later upgrade programs would typically focus on the addition of a glass cockpit and other avionics systems. The Luftwaffe's Alpha Jets were equipped with additional avionics for the attack role, such as a Doppler radar and additional hardpoints. During the 1970s, Dornier claimed that the Alpha Jet outperformed aircraft used as the McDonnell Douglas F-4 Phantom II, LTV A-7 Corsair II, and Fairchild Republic A-10 Thunderbolt II in the close air support role; the firms specifically stated that the Alpha Jet was smaller, faster, less vulnerable, more maneuverable, cheaper and had higher all-round performance than the A-10. According to aerospace publication Flight International, the Alpha Jet was more complex than competing second generation trainer aircraft, required seven man hours of maintenance for every flight hour. Nearly 5,000lb of munitions and equipment may be carried upon a total of five hardpoints, four of these being located upon the wings and a single one at the centerline on the lower fuselage. In an armed configuration, a gun pod containing a 30 mm DEFA cannon (as installed on French aircraft) or 27 mm Mauser BK-27 cannon (as installed on German aircraft) would be typically be installed upon the centerline hard point. The French Air Force decided to use the Alpha Jet primarily as a trainer. On 4 November 1977, the first production Alpha Jet intended for French service conducted its first flight. The French variant was known as the Alpha Jet E (the "E" standing for Ecole, French for "School") or Alpha Jet Advanced Trainer/Light Attack aircraft. The initial deliveries to France for service trials took place in 1978, lead to the type being introduced to line service in May 1979. The Alpha Jet E quickly replaced the Canadair T-33 and Fouga Magister in jet trainer role, as well as the Dassault Mystère IVA in its weapons training capacity. The Patrouille de France, air demonstration team of the French Air Force, fly the Alpha Jet. A total of 176 production Alpha Jet E machines were delivered up to 1985, not the 200 that had been planned. 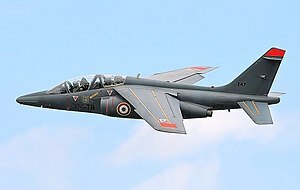 While an excellent aircraft, French air force commanders of combat units did have one complaint against the Alpha Jet, in that it was a very forgiving aircraft to fly, resulting in a lengthier and steeper learning curve when assigned to fly combat aircraft which were not so forgiving. During the early 1990s, the French Air Force investigated the Alpha Jet 3 program, which involved installing a fully digital cockpit, modernised communications suite, and a full navigation/attack and sensor training system; it was ultimately abandoned as being too expensive. In 1998, France's defence ministry examined prospective upgrades focused on the Alpha Jet's cockpit, such as the installation of a new Head-Up Display (HUD) and multifunction displays. In June 2003, Dassault revealed its plans for an Alpha Jet upgrade to potentially meet the French Air Force's long term training requirements. This upgrade was similar to that which was performed for the Belgian Air Force's Alpha Jet fleet, involving the installation of a glass cockpit, increasing cockpit compatibility with frontline aircraft such as the Dassault Rafale and Dassault Mirage 2000, as well as a structural overhaul. In September 2014, Direction générale de l'armement (DGA) and French Air Force officials were reportedly investigating the Alenia Aermacchi M-346 Master as a replacement for the Alpha Jet; Alenia Aermacchi claimed that France was interested in procuring 35 M-346s in this capacity. In April 2015, the DGA issued an initial pre-solicitation request for a replacement trainer aircraft; likely candidates for this requirement reportedly include the M-346 Master, Aero L-39 Albatros, Beechcraft T-6 Texan II and Pilatus PC-21. The Luftwaffe decided to use the Alpha Jet mainly in the light strike role, preferring to continue flight training in the southwestern United States on American trainer types instead of performing training in Germany, although Germany also used Alpha Jets based at Beja, Portugal for weapons training. On 12 April 1978, the first production German Alpha Jet performed its maiden flight, deliveries commenced in March 1979. It was designated the Alpha Jet A (the "A" standing for Appui Tactique or "Tactical Strike") or Alpha Jet Close Support variant. The Luftwaffe obtained a total of 175 aircraft up to 1983, the type was used to replace the Fiat G91R/3 fleet. In 1985, Germany began a comprehensive upgrade program, known as the Improved Combat Efficiency (ICE) program, for their Alpha Jet fleet; these upgrades were to involve the installation of a Mil Spec 1553B databus, new sensors integrated with the navigation/attack systems, modernized electronic countermeasures suite, measures to minimize the aircraft's radar and infrared signatures, protection measures around the fuel system, and new armaments such as the AGM-65 Maverick. In 1988, it was announced that the ICE program has been cancelled. A more austere upgrade program did proceed in its place, which integrated the AIM-9L Sidewinder air-to-air missile and navigation computer upgrades, along with several minor airframe and equipment refinements, such as the addition of a jettisonable gun pod. In 1992, the Luftwaffe began to phase out their Alpha Jet A aircraft, reserving 45 for lead-in fighter training. In 1993, a total of 50 were passed on to Portugal to replace the Northrop T-38 Talon and Fiat G.91 fleets, with five of these used for spares. The rest of the Luftwaffe's Alpha Jets were gradually phased out, the last leaving service in 1998, and customers were sought to buy them. In October 1995, the German military offered 42 Alpha Jets to Poland for 143 million PLN. In 1999, 25 Alpha Jets were sold to Thailand at 1 million baht ($27,000) each, replacing the North American OV-10 Bronco in the border patrol role; while the British Defence Evaluation and Research Agency obtained 12 as chase aircraft and flight test platforms due to a shortage in available BAE Systems Hawk aircraft for the role. Germany was keen to sell the retired Alpha Jets quickly since they were reported as costing around DM100,000 ($55,000) to keep in storage each month. Fairchild-Dornier received a US$43 million contract to refurbish a number of the aircraft and provide support to the end users. Apparently 32 more, including two spares hulks, were sold to the United Arab Emirates, though details are unclear. Several were also sold to private owners, such as those used by the Austrian-based Flying Bulls flight demonstration team, which flies a range of classic aircraft. In 1990, four Alpha Jets of the Nigerian Air Force were deployed in support of Economic Community of West African States Monitoring Group (ECOMOG) forces stationed in Liberia, which were engaged in combat with the National Patriotic Front of Liberia (NPFL) following an international intervention in the Liberian Civil War. In a series of strikes, these aircraft targeted and launched successful attacks upon Charles Taylor's HQ, rebel convoys and shipping, and gun emplacements at Roberts International Airport; the results of their intervention was judged by The New York Times to have given ECOMOG forces a decisive advantage in fire power. In 1992, six Nigerian Alpha Jets were placed directly under ECOMOG command, and employed against the NPLF in an extensive campaign of air strikes, road interdictions missions, anti-shipping sorties, and night raids (a task which the Alpha Jet was not normally equipped to perform). They were even employed to deny access to key bridges in order to give ECOMOG ground forces time to capture them before they were sabotaged. In total, Alpha Jets flew approximately 3,000 combat missions in support of ECOMOG, sustaining no losses but incurring some damage from anti-aircraft artillery. In 2013, Nigeria began taking steps to bring its Alpha Jet fleet back into service, upgrading 13 of the original 24 into serviceable condition, due to an urgent need for strike aircraft to participate in air support missions for counter insurgency operations against Boko Haram. In March 2016, Nigerian car manufacturer Innoson Vehicle Manufacturing (IVM) signed a supply agreement with the Nigerian Air Force to produce components and various spare parts for the Alpha Jet. In 2015, Nigeria ordered four additional aircraft from the United States; these aircraft had been de-militarized and prepared for civilian operations, however Nigeria had reportedly returned two of these to an unspecified armed configuration by early 2016. The restored Alpha Jet force have been routinely employed in combat air patrols, and has conducted multiple air strikes against Boko Haram militants over a number of years. In September 2014, multiple Alpha Jets conducted a large number of aerial bombardment missions over and around the area of Bama, Borno State, during the fight to regain the city following the withdrawal of friendly ground forces. In early October 2014, Boko Haram released a video containing the decapitation of who they claimed was a captured Nigerian Air Force pilot of a downed Alpha Jet. In March 2016, attacks performed by Nigerian Alpha Jets had reportedly dislodged Boko Haram fighters from Sambisa Forest, Borno State. On 13 September 1973, the Belgian defence minister announced that 33 Alpha Jets had been ordered in two batches of 16 and 17 aircraft. These aircraft were given the designation Alpha Jet 1B, the assembly work being performed by Belgian aircraft manufacturer SABCA. Deliveries took place between 1978 and 1980. By April 1981, the Belgian Air Force had reportedly accumulated 10,000 flight hours on their 33 Alpha Jets during training operations. The introduction of the Alpha Jet led to the retirement of Belgium's Fouga CM.170 Magister fleet; changes to the training syllabus included the adoption of a new discipline, combined flight, as well as a greater use of flight simulators. During the late 1990s and 2000s, SABCA performed a number of upgrades on the Belgian aircraft to the Alpha Jet 1B+ configuration; improvements made included the addition of a laser-gyro inertial navigation system, a GPS receiver, a HUD in the front cockpit and a HUD repeater in the rear, a video recorder and other more minor improvements. In 2000, the initial Alpha Jet 1B+ was re-delivered to the Belgian Air Force; the Alpha Jet fleet is reportedly expected to remain in Belgian service until at least 2018. On 17 September 1978, Dassault and the Arab Organization for Industrialization (AOI) signed a license manufacturing agreement for the Alpha Jet; at the time, it was projected that up to 160 Alpha Jets would be domestically produced in Helwan, Egypt. Shortly thereafter, Egypt placed an initial order for 30 aircraft, designated Alpha Jet MS1, which were to a standard trainer configuration. Four complete aircraft were directly supplied from Dassault's facility in France, while the remaining 26 of the order were domestically assembled in Egypt using knockdown kits by AOI. During the early 1980s, an additional 15 aircraft, designated Alpha Jet MS2, were ordered. The Alpha Jet MS2 bore high levels of similarity to Dassault's proposed Alpha Jet NGEA, featuring a Sagem-built Uliss 81 nav/attack system, a Thomson-CSF-built laser rangefinder and HUD, along with a digital multiplex databus. The Egptian Air Force used the Alpha Jet MS1 fleet to replace the Aero L-29 Delfín and Mikoyan-Gurevich MiG-15 in the trainer role, while the later-built MS2 standard aircraft served to replace the Mikoyan-Gurevich MiG-17 in the ground-attack role. In February 2000, Egypt was reportedly seeking to replace their Alpha Jet fleet, and was investigating several options, including the BAE Systems Hawk. Swiss firm RUAG Aviation offers full support services for the Alpha Jet in cooperation with Dassault Aviation; services provided includes recommissioning, servicing, inspections, system upgrades integration work, along with technical and logistic support. Abbatare Inc. of Arlington, Washington, under the name of "Alpha Jets USA", has imported a number of Alpha Jets into the United States, the firm modifies and sells individual aircraft in the civilian market. Canadian aviation specialist Top Aces, which operates a fleet of Douglas A-4 Skyhawks and Alpha Jets as adversary aircraft in air combat training exercises; these are often operated under contract for various military clients. Multiple civil aerial display teams have procured Alpha Jets, such as the Flying Bulls and Mustang High Flight Aerobatics teams. H211, a private company which manages the planes owned and leased by Google execs Larry Page, Sergey Brin, and Eric Schmidt, operates a single Alpha Jet, based at NASA's Ames Research Center in Mountain View, California. It is reportedly equipped with scientific instrumentation and used for research purposes. Commencing in the third quarter of 2017, Air Affairs Australia and Discovery Air will provide three Alpha Jets to the Australian Defence Force for Australian Army attack controller training and anti-surface training (simulating sea-skimming missiles) for the Royal Australian Navy. They will be based at RAAF Base Williamtown. Royal Thai Air Force Alpha Jet A during Children's Day 2007 in Wing6 Don Mueang AFB. What Europe must avoid is the kind of wasteful competition that has the Hawker Siddeley Hawk and Dassault-Breguet/Dornier Alpha Jet battling against each other in the world market. Several other nations also obtained the Alpha Jet E, including the Ivory Coast (seven aircraft), Morocco (24), Nigeria (24), Qatar (six) and Togo (five). All of these machines were from French production except for the 24 Nigerian aircraft, which were from German production. Between 1979 and 1981, the Royal Moroccan Air Force received 24 Alpha Jets which were organized into a training squadron and a COIN squadron both based in Meknes. Alpha Jets were employed in strike missions against the Polisario Front during the Western Sahara War, one of their number being shot down in December, 1985. Alpha Jet A: Attack version originally used by Germany. Alpha Jet E: Trainer version originally used by France and Belgium. Alpha Jet MS1: Close support-capable version assembled in Egypt. Alpha Jet MS2: Improved version with new avionics, an uprated engine, Magic Air-to-Air missiles, and a Lancier glass cockpit. Alpha Jet ATS (Advanced Training System): A version fitted with multi-functional controls and a glass cockpit that will train pilots in the use of navigation and attack systems of the latest and future generation fighter aircraft. This version was also called the Alpha Jet 3 or Lancier. Nigerian Air Force (Alpha Jet E) – 24 acquired. 4 upgraded in 2011, 9 more reactivated. 11 in service. Portuguese Air Force – (Alpha Jet A) - 50 former Luftwaffe aircraft) acquired 1993. Retired 13 January 2018. QinetiQ – 12 (Alpha Jet A, former Luftwaffe aircraft) - retired 31 January 2018. Bombs: 2,500 kg (5,500 lb) of payload on five external hardpoints, including a variety of bombs (such as the Hunting BL755 cluster bomb) or Drop tanks for extended range. ^ a b c d e f g "Dassault-Breguet/Dornier Alpha Jet." Flight International, 8 November 1978. p. 1882. ^ a b c d e "Alpha Jet." Archived 2012-05-15 at the Wayback Machine Dassault. Retrieved: 30 December 2012. ^ Kocs 1995, p. 112. ^ Kocs 1995, pp. 112-113. ^ Kocs 1995, p. 113. ^ a b c d e Braybrook 1984, p. 270. ^ a b Lambert 1974, p. 264. ^ Kocs 1995, pp. 112-114. ^ Kocs 1995, pp. 113-114. ^ a b c d Kocs 1995, p. 114. ^ Lambert 1974, pp. 264-265. ^ a b c d e Lambert 1974, p. 265. ^ a b c Kocs 1995, p. 115. ^ a b c d e Lambert 1974, p. 266. ^ a b c d e f g "Alpha Jet." Flight International, 1 May 1976. p. 1148. ^ a b c d e f "Alpha Jet." Flight International, 4 November 1978. p. 1649. ^ a b c d e f g "Dassault-Breguet Dornier Alpha Jet." Flight International, 19 August 1989. p. 38. ^ "New-generation trainer/attack Alpha Jet flight-tested." Flight International, 24 April 1982. p. 1033. ^ "Warlike Jets." Flight International, 2 July 1983. p. 27. ^ a b c "Dassault-Breguet Dornier Alpha Jet." Flight International, 13 August 1988. p. 36. ^ a b "New Generation Alpha Jet First Public Appearance." Flight International, 4 September 1982. p. 657. ^ "New Alpha Jet shown." Flight International, 22 June 1985. p. 9. ^ Lambert 1974, pp. 266, 277. ^ a b Fulton, Ken. "Power for the Alpha Jet." Flight International, 8 February 1974. p. 268. ^ "New Engine Being Developed for Alpha Jet." Aviation Week & Space Technology, McGraw-Hill, 1982. Volume 116, Issues 22-26, p. 115. ^ a b c d Taylor 1982, p. 105. ^ a b Braybrook 1984, pp. 275–276. ^ Christophe Gasztych, "Savoie's AUTUMN" Air Force's Monthly, March 2013, pp. 40-45. ^ a b "France studies Alpha Jet life extension." Flight International, 21 October 1998. ^ "Alpha Jet upgrade ahead." Flight International, 17 June 2003. ^ Perry, Dominic. "France to evaluate M-345 as possible Alpha Jet replacement." Flight International, 11 September 2014. ^ Perry, Dominic. "PARIS: France plans Alpha Jet replacement." Flight International, 16 June 2015. ^ Braybrook 1984, pp. 270, 276. ^ "Luftwaffe outlines Alpha Jet update." Flight International, 27 April 1985. p. 8. ^ "Dassault-Breguet Dornier Alpha Jet." Flight International, 1 August 1987. p. 27. ^ Sijger 1994, pp. 128–129. ^ Barrie, Douglas. "Germany nears Alpha Jet deal." Flight International, 7 April 1992. p. 17. ^ "Dassault-Breguet Dornier Alpha Jet." Flight International, 19 July 1994. p. 40. ^ Michta 2016, pp. 70-71. ^ a b "Thailand wants F-16s and shrinks Alpha Jet plan." Flight International, 11 August 1999. ^ "UK buys ex-German air force Alpha Jets." Flight International, 18 August 1999. ^ "UAE closes on Alpha Jet purchase." Flight International, 24 November 1999. ^ a b "Alpha Jet." The Flying Bulls, Retrieved: 30 May 2016. ^ a b "ECOMOG Air Operations During The Liberian Civil War. An Official Overview of the Early Phases; 1,000 Sorties Flown October 1992-July 1993". Defense Studies Journal (Special Issue on ECOMOG). 1996. ^ "Waging War to Keep the Peace: The ECOMOG Intervention and Human Rights." Human Rights Watch, June 1993. Volume 5, Issue No. 6. ^ Adebajo 2002, p. 82. ^ "Photo Newsreel: Nigerian Air Force Reinduct 9 Alpha Jets and a C130 Hercules". Beegeagle's Blog. Retrieved 1 January 2016. ^ Monks, Kieron. "Nigeria's first car maker takes to the skies in fighter jets." CNN, 30 March 2016. ^ Karls Tsokar, Abuja. "Local firm produces spare parts for NAF fighter Pharmacist." The Guardian, 11 February 2016. ^ Binnie, Jeremy. "Nigeria re-militarises two Alpha Jets." IHS Jane's Defence Weekly, 27 January 2016. ^ "Nigerian Air Force receiving additional Alpha Jets". DefenseWeb. Retrieved 1 January 2016. ^ Mutum, Ronald. "Air Force refits training aircraft for combat mission." Daily Trust, 26 January 2016. ^ "Nigeria military aircraft bombing Boko Haram missing." Premium Times, 14 September 2014. ^ Linning, Stephanie. "Boko Haram releases video showing beheading of Nigerian Air Force pilot as terror leader who was thought dead reappears." Daily Mail, 4 October 2014. ^ "VIDEO: Boko Haram terrorists behead Nigerian Airforce Pilot (Viewer’s discretion)." Archived 2016-08-06 at the Wayback Machine African Spotlight, 5 October 2014. ^ Lauya, Adbul. "NAF Alpha jets dislodge Boko Haram terrorists from Sambisa forest." The Authority, 26 March 2016. ^ a b "Belgian Air Force Alpha Jet training." Flight International, 18 April 1981. p. 1109. ^ Penny, Stewart. "Belgium updates Alpha Jet fleet." Flight International, 3 November 1999. ^ a b c "Egypt rolls out Gazelle and receives Alpha Jets." Flight International, 10 December 1983, p. 1518. ^ "Egypt shops in China for trainer." Flight International, 29 February 2000. ^ "Training aircraft services for Alpha Jet." Archived 2016-06-27 at the Wayback Machine RUAG, Retrieved: 30 May 2016. ^ "Alpha Jets." Archived October 8, 2008, at the Wayback Machine Alpha Jets USA. Retrieved: 17 July 2012. ^ David, Donald. "Supersonic aggressors for hire [CAN2015D2]." IHS Jane's 360, 28 May 2015. ^ "Classic Aerobatics for your Airshow!" Mustang High Flight Aerobatics, Retrieved: 30 May 2016. ^ Helft, Miguel. "A New (Fighter) Jet for Google’s Founders?." The New York Times, 23 October 2008. ^ Alex Hern (12 December 2013). "Google execs saved millions on private jet flights using cheaper NASA fuel". the Guardian. Retrieved 12 Dec 2013. ^ "Air Affairs to provide three Alpha Jets for ADF training". Australian Aviation. 3 March 2017. ^ Taylor 1976, p. 63. ^ Mata 2017, pp. 87–89. ^ Barreira, Victor (20 November 2017). "Portugal to phase out Alpha Jet A". IHS Jane's 360. Archived from the original on 20 November 2017. Retrieved 20 November 2017. ^ "Portugal retires its Alpha Jets". Air International. March 2018. p. 16. ISSN 0306-5634. ^ Harding, Ian (March 2018). "Alpha Jet retires". Air International. p. 21. ISSN 0306-5634. Adebajo, Adekeye. Building Peace in West Africa: Liberia, Sierra Leone, and Guinea-Bissau. Lynne Rienner Publishers, 2002. ISBN 1-5882-6077-1. Braybrook, Roy. "Training Maturity". Air International, Vol. 26, No. 6, June 1984, pp. 269–276, 312–313. Bromley, UK: Fine Scroll. ISSN 0306-5634. Eden, Paul, ed. The Encyclopedia of Modern Military Aircraft. London: Amber Books, 2004. ISBN 1-904687-84-9. Kocs, Stephen A. Autonomy Or Power? : The Franco-German Relationship and Europe's Strategic Choices, 1955-1995. Greenwood Publishing Group, 1995. ISBN 0-2759-4890-0. Lambert, Mark. "Alpha Jet: The co-operative trainer/attack aircraft." Flight International, 28 February 1974. pp. 264–267, 277. Mata, Paulo. "Last Days". Air International, Vol. 93, No. 1, July 2017, pp. 86–89. ISSN 0306-5634. Michta, Andrew A. The Soldier-Citizen: The Politics of the Polish Army after Communism. Springer, 2016. ISBN 1-3496-1596-X. Stijger, Eric. "Alpha Jets for Portugal". Air International, Vol. 46, No. 3, March 1994, pp. 128–131. Stamford, UK: Key Publishing. ISSN 0306-5634. Taylor, John W R (ed). Jane's All The World's Aircraft 1982-83. London: Jane's Yearbooks, 1982. ISBN 0-7106-0748-2. Wikimedia Commons has media related to Alpha Jet. This page was last edited on 23 February 2019, at 22:25 (UTC).